The Oscars are finally here! I’m looking forward to seeing Hugh Jackman in a tux and hopefully shaking his money maker a little. There’s a rumor that Anne Hathaway will be doing the opening musical number with him (click here to see him rehearsing, sans Anne). Hathaway can definitely sing (have you seen Ella Enchanted or her hosting stint on SNL?) and we have plenty evidence of Jackman’s musical prowess so it should be entertaining if it does happen. Now, I know everyone and his best friend’s second cousin’s lip waxer have already done predictions so I wasn’t gonna do any more than the ones I already made back in December and January. But then I thought, Why not? Maybe I can help someone win fifty bucks in an Oscar pool to put towards next week’s groceries. I’ve seen all the nominated movies, except for the shorts and foreign films (you’re on your own there!) so I’m not making wild guesses based on hype. These are my (hopefully) informed opinions based on the actual quality of the films. I know—the Oscars are sometimes more about PR but I can hope, right? Do you agree with my choices? Who are you rooting for? Post a comment then check back Monday for scoopy stuff from inside the Oscars from my sources who will be there! Pretty good picks you got there! 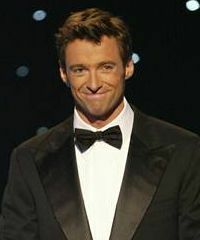 And Hugh in a tux? I think I’ll have to fan myself. Seriously, though, I’m really looking forward to seeing what he does. He’s the consummate performer. Haven’t yet seen Slumdog, but agree pretty much all ’round with your predictions. I wish, though, that there were room for Melissa Leo. Her performance in Frozen River is amazing! Is Tell No One up for anything? It’ll surely be an exciting night! I agree that Melissa Leo’s performance is amazing. It’s so tough and uncompromising. Tell No One isn’t up for anything. I guess France didn’t submit it for consideration. Boo! Button shouldn’t get anything beyond a shout out from the Best Art Direction category. SLUMDOG!! SLUMDOG!! Everybody now, SLUMDOG! SLUMDOG!! People in the back, SLUMDOG, SLUMDOG!! I can only hope that the studios learn something about which stories they put their money behind once Slumdog Millionaire sweeps the oscars. Ugh, I’m sooooo sick of hearing how wonderful Man On Wire was! You, too? I agree with everything else you chose, PCN, but I gotta draw the line at Man On Wire. Good predictions! I am sad Josh Brolin didn’t make your list either. You are probably right though, I guess it was just too subtle a performance. BTW: Can you tell me why there’s no mention of Nothing But The Truth? I saw a private screening and I thought it was released in theaters…..What happened? Thanks, PCN! I WON $200 IN MY OFFICE OSCAR POOL USING YOUR CHOICES! I shall accept a commission in cash or cookies.